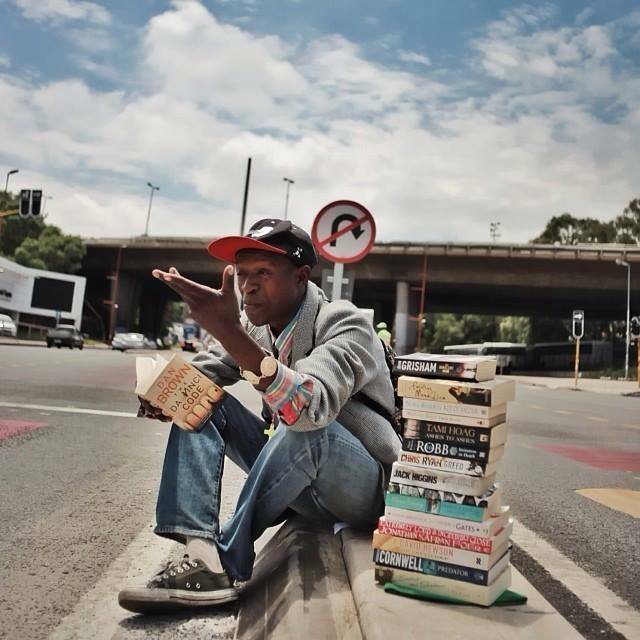 This young 24-year-old homeless man, Philani, sits on the side of Empire Road in South Africa and, rather than begging, he provides book reviews. Philani collects all of these books, reads each of them, and then provides reviews for people who are passing by. If you like the review, he will ask if you want to buy the book. This is how he makes a living. In the video (see below) Philani notes that “reading is not harmful. There is no thing as harmful knowledge” and highlights the virtues of reading, reminding us how much better a book can make a person’s life, a child’s life, and the life of someone in a care home for the elderly. “he touches on social justice and I think that’s the one thing lacking in the world”. Philani’s appreciation for the value of books was apparently inspired when he managed to rescue himself from drug addiction by reading self-help books. What an inspirational young man! it would be great to drop by his sidewalk shop each week.. to take a lunch for myself and for him and to enjoy his reviews… maybe grisham will learn of this story through your post?! What a lovely idea! Great post, thanks for sharing! I love the entrepreneurial mindset of this gentleman. Doing something he loves and sharing it with others. Books can bring us together. Read something new this week! This lifts my spirits ….. there is kindness and good hearts still out there! !